The oregano plant has been used since ancient times for its fragrance and appealing flavor, as well as for its anti-inflammatory, digestive, antispasmodic, and antiseptic properties. Oregano is a popular spice, widely used for culinary purposes across the world, particularly in the Mediterranean cuisine. 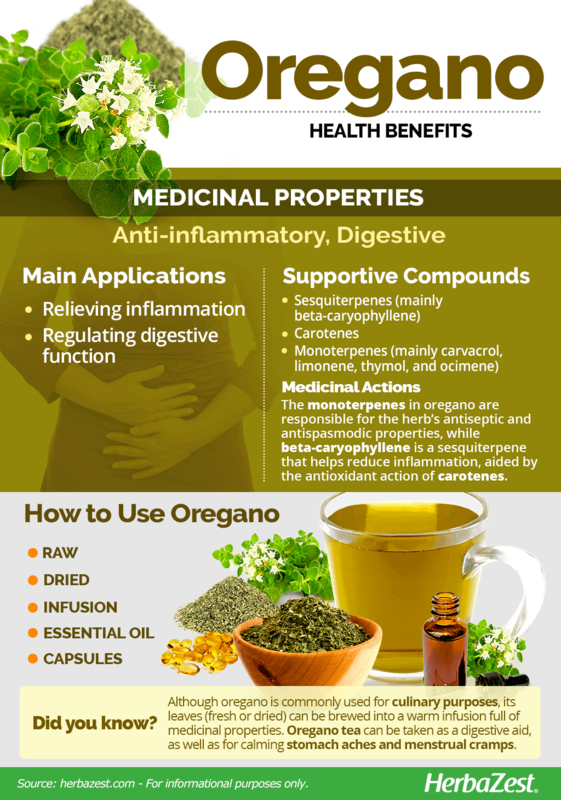 However, the medicinal properties of oregano have also been traditionally reaped in medicinal forms, in order to treat a variety of conditions. Learn more about oregano benefits for overall health, as well as its history and ways of consumption. Relieving inflammation. 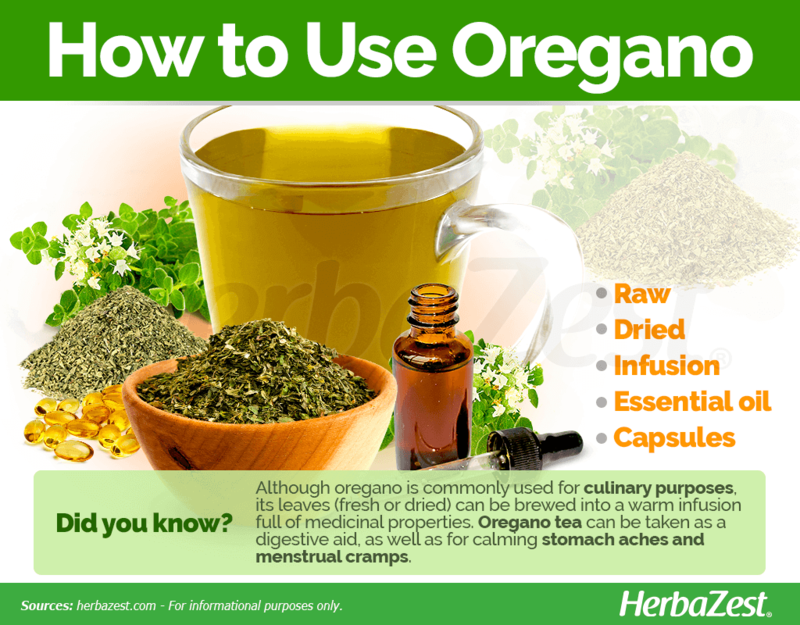 Oregano has been traditionally used to soothe menstrual cramps and joint pain caused by internal inflammatory processes. Regulating digestive function. Scientific studies suggest that oregano properties include the ability to kill potentially harmful bacteria in the digestive tract. It also helps with digestive issues, such as flatulence and stomach aches. 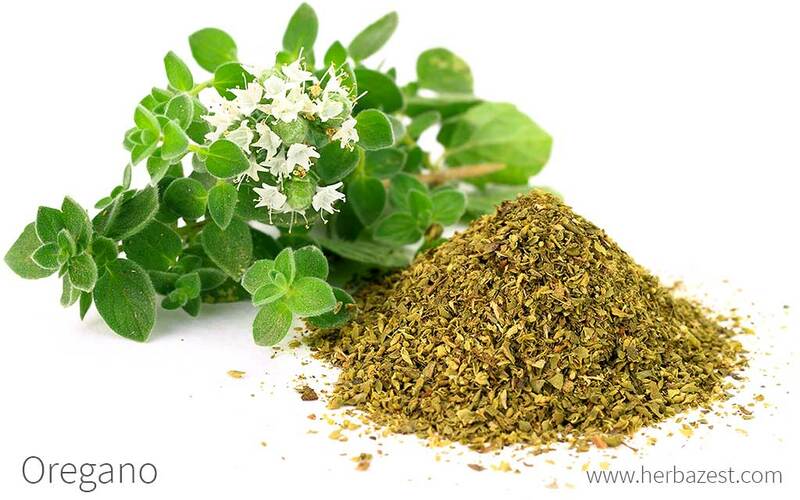 Additionally, over the course of European history, the oregano plant has also been found effective for relieving rheumatism, toothaches, fevers, and menstrual cramps, as well as digestive and respiratory problems, since it has expectorant properties that help remove phlegm and clear airways. Modern researchers have highlighted the antiseptic and antifungal oregano properties; however, further studies are necessary to corroborate these claims. Oregano extract contains a large amount of monoterpenes (mainly carvacrol, limonene, thymol, and ocimene) which, along with sesquiterpenes, are the main constituents of essential oils volatile oils and are responsible for oregano's antiseptic and antispasmodic properties. 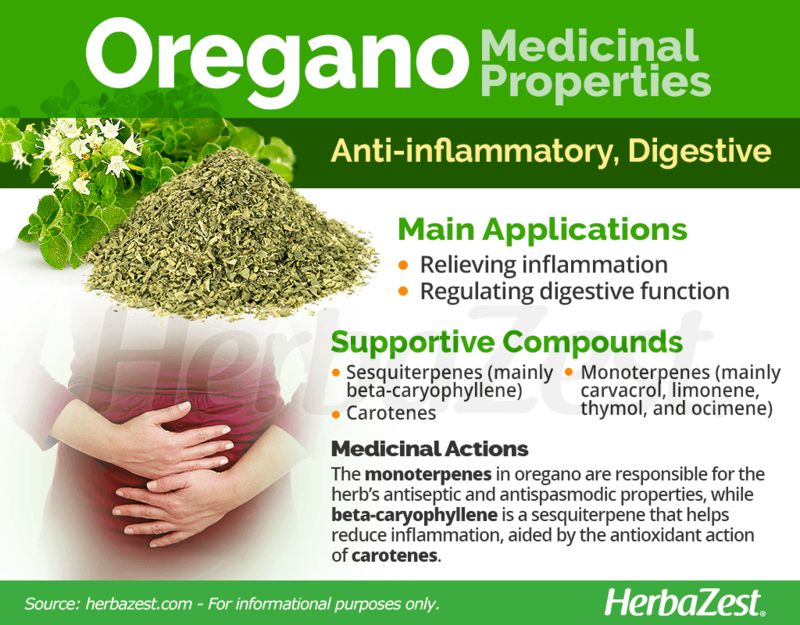 Oregano also contains beta-caryophyllene, a sesquiterpene that blocks the synthesis of prostaglandins, which are hormones that control the immune response and are involved in inflammatory processes. In addition, this phytocompound provides analgesic, antipyretic, and anticoagulant actions. The most important antioxidants in the oregano plant are carotenes, and it also contains a wide variety of essential nutrients. MODERN RESEARCHERS BELIEVE OREGANO MAY HAVE ANTISEPTIC AND ANTIFUNGAL BENEFITS. Other herbs with anti-inflammatory benefits are peony and devil's claw, whereas fennel and cardamom also help with digestion. Oregano is considered generally safe for oral and topical use; however, sensitive people can experience allergic reactions that may include difficulty breathing, speaking, or swallowing, facial swelling, and itching. People allergic to Lamiaceae species, such as thyme, basil, marjoram, spearmint, and sage, should avoid oregano. Likewise, those taking any kind of supplements (specially iron) and medications (prescribed or not), should ask a qualified physician before taking oregano in medicinal amounts. In the case of skin irritation after topical application, the use of oregano oil must be discontinued. Any form of oregano must be avoided withing two hours before or after taking an iron supplement or iron-rich foods, since the herb inhibits the absorption of this essential mineral. Just like other aromatic herbs, oregano is used in small, culinary amounts. However, it is a fair source of dietary fiber and many essential nutrients. Fresh or dried, the leaves of oregano deliver important minerals, mainly calcium, iron, and manganese, which are crucial for bones health and red blood cells production, as well as for the optimal functioning of muscular and nervous systems. Other minerals present in trace amounts in oregano are magnesium, potassium, zinc, and copper. Oregano is a good source of vitamin K (phylloquinone), which is best-known for its role in helping coagulation but have also been linked with higher bone mineral density and a reduced risk of hip fracture. Furthermore, oregano leaves provide adequate amounts of vitamin E (alpha-tocopherol), a fat-soluble nutrient with immune boosting properties, which helps the body to fight off harmful bacteria and viruses, and also promotes cardiovascular health by improving blood flow. Though present in very small quantities, oregano also contains all B complex vitamins. 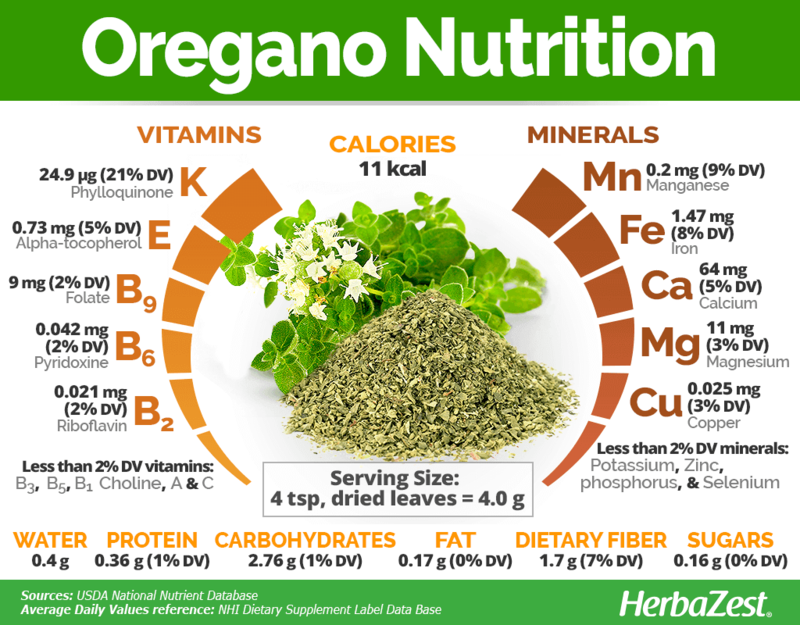 Four teaspoons of dried leaves of oregano (4 grams) provide 11 calories and 7% of the daily value for dietary fiber. Oregano is most widely known as a culinary ingredient, and its aromatic qualities are particularly used in a variety of Italian dishes. However, oregano medicinal benefits can also be obtained from more concentrated medicinal forms. Raw. The fresh leaves of oregano have an aromatic and slightly bitter taste, and can be used in a variety of salads and cooked dishes, as well as in infusions and other medicinal preparations. Dried. With a longer shelf life, the dried leaves of oregano can be used as a flavoring agent or brewed into herbal infusions. Infusion. Fresh or dried, the leaves of oregano can be steeped in hot water in order to obtain a warm infusion. Oregano tea can be taken as a digestive aid, as well as for calming stomach and menstrual cramps. Essential oil. This concentrated preparation can be added to water or juices for a carminative, anti-inflammatory effect, or used topically for the relief of joint inflammation, as well as for sanitizing superficial wounds, cuts, and scraps. Capsules. As a dietary supplements, oregano oil capsules can be taken once or twice a day, preferably with meals, for a digestive effect. Raw oregano is easy to find in most grocery stores or local markets around the world. It usually comes as fresh branches, which should be rich green. Dried oregano can also be purchased in most supermarkets, alone or mixed with other aromatic herbs. Oregano teabags can be easily found through online retailers. Oregano essential oil and capsules are easily found in specialized health stores and online retailers, which stock a wide variety of brands and different concentrations, so it is recommended to read the labels carefully. The oregano plant (Origanum vulgare) is one of the most popular Mediterranean spices due to its many culinary and medicinal applications. This hardy perennial is highly adaptable to a wide range of conditions; however, it prefers sunny, temperate climates. Like other herbs native to the Mediterranean, the oregano plant needs full sun exposure and a median soil temperature of 70°F (21°C). While a loamy soil with a good drainage system is required, oregano does not require much rainfall or watering, and excess soil humidity should be avoided because the plant has a tendency towards root and stem rot. Although it is fairly resistant to pests, the oregano plant can be attacked by spider mites and aphids. Oregano should be harvested when the plant has reached about 5 inches (12.5 cm) tall, and before it flowers in order to reap the most essential oil of the highest nutrient content. After four years, oregano plants tend to produce leaves of reduced quality, at which time it is suggested that they be replaced with newly-planted specimens. More detailed information about growing oregano can be found in the herb garden section. Sometimes called wild marjoram or winter marjoram, the oregano plant (Origanum vulgare) is an aromatic herb native to the dry, rocky soils in the mountainous areas of southern Europe, southwest Asia, and the Mediterranean basin. Oregano plants can reach up to 31 - 39 inches (0.8 - 1 m) and have thin but hardy stems with oval, dark green leaves and white or purple flowers. The oregano plant (Origanum vulgare) is a member of the Lamiaceae family, which 6,900 - 7,200 species of flowering species spread out over 236 genera. This family is often referred to as the mint or deadnettle family. It contains many other popular, well-known, and economically-important herbs, such as sage (Salvia officinalis), peppermint (Mentha x piperita), rosemary (Rosmarinus officinalis), and basil (Ocimum basilicum). There are two notable subspecies of oregano: O. vulgare subsp. gracile, native from Kyrgyzstan, which has a pungent and spicy flavor and is often grown more for its ornamental value, and O. vulgare subsp. hirtum, originated in Italy, which is considered the best all-purpose culinary subspecies of oregano, with vigorous and hardy growth, and dark green, hairy foliage. Several cultivars of oregano have also been developed, being the most distinct and distinguished 'Aureum', which has golden foliage and a mild taste, and 'Nana', a dwarf cultivar. Archeological findings show that oregano was already widely cultivated as a food crop in Ancient Greece, approximately around the 9th century BCE, before written records began. It was valued for its medicinal purposes, with Hippocrates using it for its antiseptic properties and as an antidote for some poisons. When the Roman Empire conquered Greece, the Romans adopted oregano into their diet, and the vastness of their empire allowed its use to spread throughout the world, as the herb eventually found its way through the entire Eurasian continent, from China to the British Isles. According to Greek mythology, oregano was created by the goddess Aphrodite and given to humankind in order to spread happiness. The term origanum comes from the Greek words oros or "mountain", and ganos, meaning "ornament". Oregano has been used by different cultures to crown married couples, placed on graves to give peace to departed spirits, and as a good luck charm. Some cultures consider oregano a natural aphrodisiac. Oregano's main economic importance is its trade as a spice, and it is in high demand worldwide. New Zealand is currently the world's biggest producer of oregano. As this herb increases in popularity, its export industry is also gathering pace. In 2009, oregano exportation from Peru alone increased 31%, amounting to a net worth of $1.75 million USD in the first two months of that year alone. Oregano can be used as an effective mosquito and insect repellent. Wisconsin State Herbarium, Origanum vulgare L.